Description: The Daedalus 88, with Glenn Tremml piloting, is seen here on its last flight for the NASA Dryden Flight Research Center, Edwards, California. 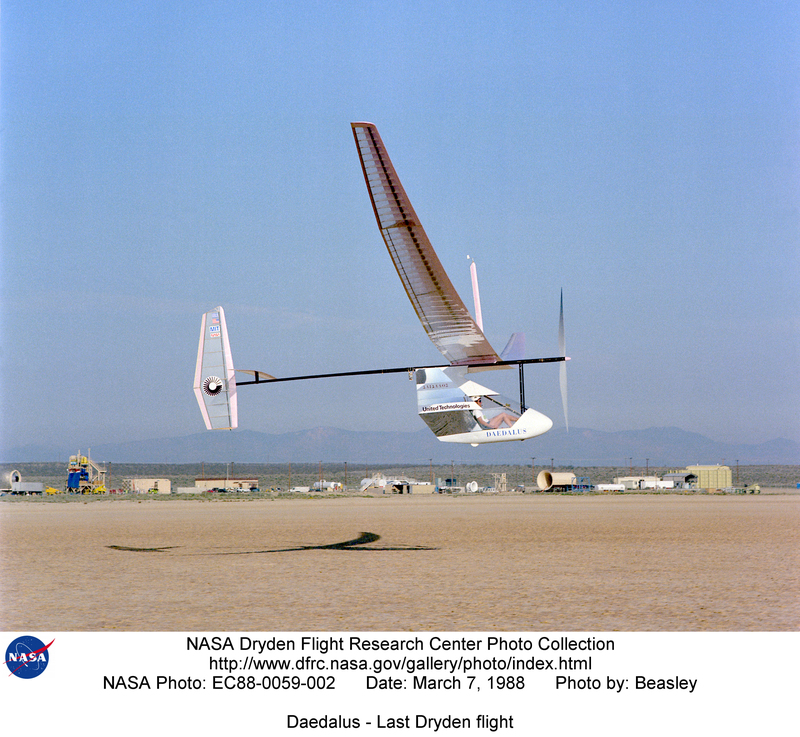 The Light Eagle and Daedalus human powered aircraft were testbeds for flight research conducted at Dryden between January 1987 and March 1988. Description: These unique aircraft were designed and constructed by a group of students, professors, and alumni of the Massachusetts Institute of Technology within the context of the Daedalus project. The construction of the Light Eagle and Daedalus aircraft was funded primarily by the Anheuser Busch and United Technologies Corporations, respectively, with additional support from the Smithsonian Air and Space Museum, MIT, and a number of other sponsors. To celebrate the Greek myth of Daedalus, the man who constructed wings of wax and feathers to escape King Minos, the Daedalus project began with the goal of designing, building and testing a human-powered aircraft that could fly the mythical distance, 115 km. To achieve this goal, three aircraft were constructed. The Light Eagle was the prototype aircraft, weighing 92 pounds. On January 22, 1987, it set a closed course distance record of 59 km, which still stands. Also in January of 1987, the Light Eagle was powered by Lois McCallin to set the straight distance, the distance around a closed circuit, and the duration world records for the female division in human powered vehicles. Following this success, two more aircraft were built, the Daedalus 87 and Daedalus 88. Each aircraft weighed approximately 69 pounds. The Daedalus 88 aircraft was the ship that flew the 199 km from the Iraklion Air Force Base on Crete in the Mediterranean Sea, to the island of Santorini in 3 hours, 54 minutes. In the process, the aircraft set new records in distance and endurance for a human powered aircraft. The specific areas of flight research conducted at Dryden included characterizing the rigid body and flexible dynamics of the Light Eagle, investigating sensors for an autopilot that could be used on high altitude or human powered aircraft, and determining the power required to fly the Daedalus aircraft. The research flights began in late December 1987 with a shake-down of the Light Eagle instrumentation and data transfer links. The first flight of the Daedalus 87 also occurred during this time. On February 7, 1988, the Daedalus 87 aircraft crashed on Rogers Dry Lakebed. The Daedalus 88, which later set the world record, was then shipped from MIT to replace the 87's research flights, and for general checkout procedures. Due to the accident, flight testing was extended four weeks and thus ended in mid-March 1988 after having achieved the major goals of the program; exploring the dynamics of low Reynolds number aircraft, and investigating the aeroelastic behavior of lightweight aircraft. The information obtained from this program had direct applications to the later design of many high-altitude, long endurance aircraft.